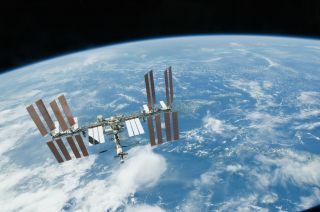 The International Space Station flies above Earth in 2010. Two crewmembers will launch to the orbiting outpost on a one-year mission in March 2015. The first crew to embark on a yearlong International Space Station mission could help NASA get to Mars. NASA astronaut Scott Kelly and Russian cosmonaut Mikhail Kornienko will launch to the space station in March with cosmonaut Gennady Padalka. Kornienko and Kelly will remain on the orbiting outpost performing research until March 2016. This mission will mark the first time a crew has spent a continuous year on the space station, and researchers are planning to take advantage of it. Scientists and doctors on the ground will monitor the way Kelly and Kornienko's bodies change throughout the year in order to understand the potential effects of long-term spaceflight (like a mission to Mars) more fully. NASA astronaut Scott Kelly is scheduled to launch to the International Space Station for the first yearlong mission on the orbiting outpost. Image uploaded Jan. 16, 2015. Astronauts will likely need to spend more than a year in weightlessness if flying to Mars. The kind of research that Kornienko and Kelly are expected to perform in orbit could be a first step toward understanding how to mitigate any harmful changes the body might go through during a long trip in space. NASA officials have a good sense of how the body behaves when exposed to the rigors of spaceflight for up to six months, but after that, the data is a little hazy. NASA astronaut Scott Kelly (right) and Russian cosmonauts Mikhail Kornienko (center) and Gennady Padalka (left) take questions from the press during a news conference on Jan. 15, 2015. Kelly will be the first American to spend a full year in space, however, Kornienko will not be the first cosmonaut to do so. A number of Russians spent a continuous year on the Mir space station in the 1980s and 1990s. "We know a lot about six months, but we know almost nothing about what happens between six and 12 months in space," Julie Robinson, a space station program scientist, said during the news conference yesterday. Kelly and Kornienko's one-year mission is designed to help fill in the gaps between what the body experiences after six months versus what it experiences after one year. Kornienko and Kelly's eyes will be monitored for any changes to their eyesight or ocular health during the mission, NASA officials said. Astronauts have noticed changes in intracranial pressure due to fluid shifts that can result in possibly negative changes to the eyes, scientists have said. Scientists are also interested in monitoring the microbial environment (microbiome) inside the crewmembers, keeping tabs on their physical performance, fine motor skills, metabolism and other health factors throughout the mission. Those ground tests are "looking at the practical tasks that astronauts have to do after a transit to Mars, things they would have to do right away after they land on Mars," Robinson said. "One thing that crewmembers would have to do is get out of their suits, get out of the protection that they've been in for a pretty rough landing. They have to be able to jump out of a vehicle perhaps, jumping down some stairs."